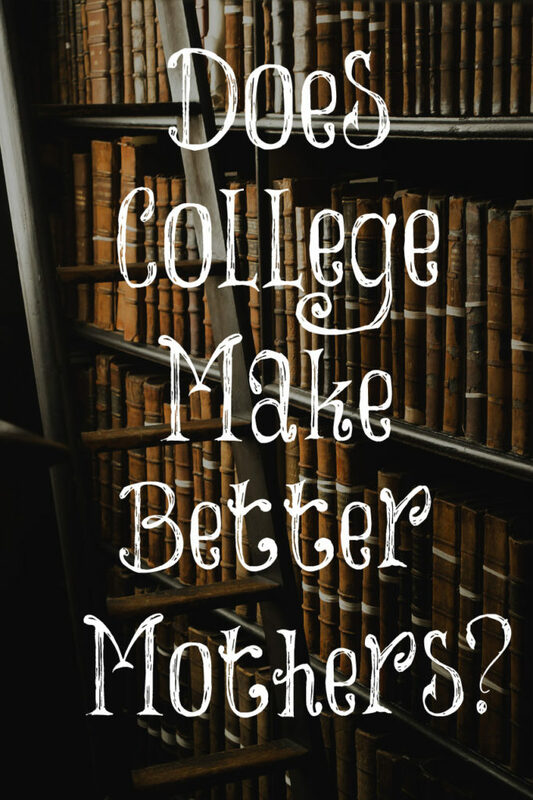 Does College Make Better Mothers? There is nothing biblical about going to college so let’s just get that out of the way. There’s no command that tells women that they must get a job or even make money. Yes, there are examples of women who made money in the Bible but no commands from God that women are required to make money. Women going to college and making money are not biblical concepts so let’s not try to say that they are or are of any value to God. Women have told me that college makes better mothers. Is this true? I don’t believe so at all. All that is required of a mother to be a good mother is for her to love her children deeply, sacrifice for them, and want to be the one who raises them full time. Yes, some want to raise them full time but are unable. I am not referring to them. The key word is “want.” Many mothers don’t want to be the ones raising their children and I believe college has made this much more common. As I have stated in previous posts, most colleges are extremely expensive so mothers come into marriage with a lot of debt. This debt often prevents the couple from having children sooner rather than later and if they do have children, the mothers most likely have to keep working to pay off the debt. This doesn’t make a good mother. Dennis Prager stated that people go into universities knowing the difference between male and female and come out not knowing the difference. So this is a big negative for secular universities. The Bible warns us to not be equally yoked with unbelievers (and no, this isn’t concerning marriage but that is true, too. Look at 1 Corinthians 6:14-18.) We are repeatedly warned against listening to false teachers and those who manipulate the Word of God which are both rampant in the universities. The colleges teach women nothing about biblical womanhood (how to be a good wife and mother). In fact, even the Christian colleges teach women more about how to be a feminist: how to be independent, how to make money, and how women don’t need a man. This was true even many years ago when I attended a Christian college. As believers in Jesus Christ, this is not what we are commanded to learn. We are taught to depend on the Lord Jesus Christ and then if we get married, to depend upon our husband’s protection and provision. Children are more insecure and emotionally unstable than they were in past generations and I believe it’s due to mothers not being home with their children full time. Dr. Brenda Hunter in her book “Home By Choice” proves this to be true. Of course God wants mothers raising their own children! I’m not sure why so many women are offended by this truth. Colleges, debt, and careers have taken mothers from their children and this has been devastating. Marriages are crumbling and children are abandoned. It’s a very high price that our children have had to pay so women can go to college and have careers. No, I’m not telling women to not go to college but warning them about the consequences. Many young people who were raised in Christian homes walk away from the faith in universities. This is the worse consequence of all but how can we expect anything different when we disobey the Word of God (1 Corinthians 6:14-18). If you can get through college without any debt, get a career that you can quit immediately when you have your first baby, keep a solid foundation in Jesus Christ and a good godly support system around you, and don’t allow the filth in the universities (if you go to one) not affect you, then go for it but there are things women can do without going to college if they aren’t married. Our nation idolizes college (as I could clearly see from the responses from my viral post) and, as believers, we should not. We need to carefully count the cost before making any decisions such as this. My mom never went to college and has been an excellent mother which is way more important than any college degree or career she could have had. No, women who go to college don’t automatically make better mothers. That is a myth that can be easily seen by looking at the sad state of our culture and children. I have learned far more since I stayed home and had time to read/study the Bible in the mornings than I ever did before. Thank you, Shelley. I have grown in the wisdom and the knowledge of the Lord by spending time in His Word and listening to godly preachers of the Word. College sure didn’t help me to grow in wisdom, unfortunately. When I went to college, it was affordable but it sure isn’t any longer and something young women need to begin taking into consideration and how it affects their future. Truer words have never been spoken. Oh, and college costs are relative to time. Of course, it was cheaper 40 years ago, but people earned less. All relative. Thanks again, Lori. This type of encouragement is so badly needed today. As you stated, women are being taught to be independent which is not Biblical at all. We ALL need to depend on the Lord, and women have been doubly blessed if they have a Godly husband to depend on. It’s not weakness in character to gratefully accept the protection and provision our husbands give us. I went to college and had very little debt, but it did nothing in preparing me for the high calling of being a wife and mother. Thankfully the Lord sent some dear older women to teach me in these areas. I sincerely hope many young women will heed the teaching and mentoring you give as well, Lori. May God continue to bless your ministry. Thank you, Holly! You were blessed to have an older women teach you biblical womanhood. We absolutely need a whole lot more of them! Good post. When I was in high school we had two avenues to graduate – Trade or College. I chose trade and took three years of secretarial skills, got a job two weeks after graduating and worked until I married and had my first baby. Have never looked back and thought ‘poor me’ for not having a college degree. I am still a homemaker, hubby is retired and I’ve got a volunteer job as the CEO of a local chapter of a national non profit. All from skills I learned as a homemaker. My husband and I paid for trade school for our two daughters .. we refused to pay for four year degrees and ‘strap’ ourselves to debt in retirement. We have family members that extolled the wonders of college to their daughters .. as far as I know, two of thee have degrees and stay home with their families. Both degrees are out of date now and would take more money to get up to date. Third daughter went the PHD route .. married with no kids. She’s over educated and has a hard time finding grant work. It’s our culture that has drilled it into the minds of young women that they “need” to go to college and we need to let them know that this isn’t the only option for them. You were a wise young woman, Mrs. Mac, and a wise mother! Lori, I was one of those who went community college part time not long after I became a Christian to study to be a preschool teacher. My goodness I remember some of the professors being anti-Christian and anti- God. It was awful! So anyway, going to college didn’t make me a better mother. Most of what I learned about child development was way off base. The sad thing I remember is none of the books taught how children need full time mothers. Not. Even. One. Agreed, Regina. Secular colleges and universities teach no wisdom because they have excluded God from everything. There is NO wisdom apart from the Lord. Hello Lori, I am a reader of your blog and a stay at home mama to 3 precious daughters. I agree with you that college is unnecessary. Many people treat it as an essential part of a successful life and it is not. However, I had a good experience in college (with no debt) that did help me become a better mother. I attended a large University and received a teaching degree with the intention of teaching until I married and had children. I lived at home with my parents under their authority at this time. I was part of an on campus ministry that truly helped me grow in my faith. We had a heart for evangelism and seeking the lost. I encountered so many young people my age who were open to hearing and talking about the Gospel. I had the opportunity to have a christian voice in class discussions and be the LIGHT as Jesus called us to be. It was a season of ministry that I’m so thankful for. I was also part of a service sorority that did projects all around the city to help our community. I met my amazing husband through campus ministry and got my degree right before getting married. I was never a teacher but I don’t view my time in college as a waste. I learned time management, self discipline, and grew in faith. My ministry to the lost prepared me for ministry to my husband and family. All of these areas are used in my life at home. Was my faith tested? Yes! Was I tempted? Yes. But through that temptation I learned how to resist and how to be a light in dark places. Once again I don’t believe that college is necessary for a successful life, but my experience was a positive one. When the time comes, my husband and I will wisely help our daughters decide what is best for them in terms of life after high school diploma. College won’t be the only choice on the list but it will be an option for us. It is amazing that people are only presented, in most cases, college as a path to a lucrative career. The Maxwell’s from http://www.titus2.com have raised eight children who are all thriving with no college educations. All sons bought their homes debt free before marriage. They have an excellent book on just that. Trade schools are another option that isn’t really explored fully either. But I digress, this is really about uni making good mothers–laughable! Not one course on home economics or the like when I went and it is still the case. You would think Christian colleges would present some coursework on parenting, etc. No to that, too. Thank you for putting this perspective out there and hopefully it will make a few women think! Lori – education is to equip us to meet our God-ordained roles. Certainly college as it is today does not do this! The only exception I can think of is Hyles-Anderson College, which does have a well regarded degree program in Marriage and Motherhood. 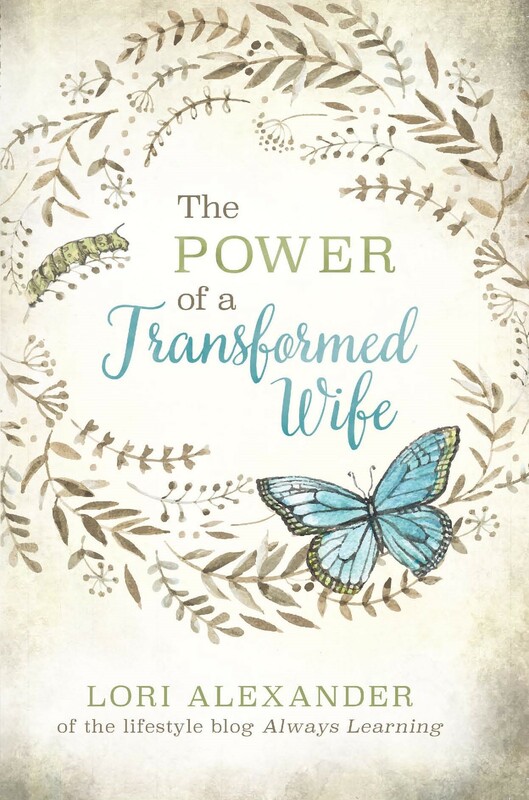 Our daughters would need to live at home or (preferably) be married to a Godly man also enrolled at Hyles Anderson, but if they are still awaiting their first blessing this could be a good program. Women can learn at home as well, but I find the focus on preparing for life as the helpmeet to a missionary called to foreign counties an area where specialized education in a suitable environment may be helpful preparation for that role. Amen! Thank you for posting this! I wish more Christians would read such an article and have their eyes opened! I did go to to college, and was happy to go and did somewhat enjoy my learning experience (although I’m not sure how much I actually learned), but I stayed VERY far from the crowd and pressure of social life … I worked at the college library, graduated without debt, enjoyed my “career” for a few years. After I married and had my first baby, I told my boss that I would not be coming back … not even to “milk” the system as so many of my friends did. These friends would keep their job while on maternity leave (and in Canada, it is a year long), return pregnant and reap the benefits of a salary that was not earned for another maternity leave. I told my boss I knew I was having more children and I think he was grateful I was honest. So after the first baby to come, I knew I was going to stay at home and raise the children. My mom desperately wanted me to go to college. Since my father abandoned us, we would’ve soon been homeless without my grandparents. My mom had loved being a housewife, but after my father left, she wanted to protect me from a similar fate. I went to junior college while living at home and then to a state university for my Jr. and Sr. yrs. I had no debt as my parents paid for it. By the time I graduated, I knew without a doubt that no kid of mine would ever go away to college as a freshman!! At 20, I was far more equipped to deal with the environment. Most of my friends didn’t marry until 30ish and I can honestly say that I met nobody I would’ve even considered marrying.so I was on my own for a good many years until finally finding Mr. Right and marrying at 31. I can’t say I regret college because I did learn so much, but I always knew I wanted to marry and raise kids. Never had any kids, but I love being a housewife. I suggest the better question is Does College Make Better Wives? The woman was created to be the helpmeet, not to be a mother. I think she was right to focus on the motherhood aspect, since working full time will have a much greater effect on kids than it will on a husband. Assuming a woman’s husband is gone all day working also, he won’t necessarily suffer from his wife’s absence. Kids, however, obviously would have to be left in the care of others. GT: we are to use scripture, not our experience. I have 2 degrees from community college and was shocked how anti Christian some classes were. The outright debauchery in a fair once a year I learned to avoid.